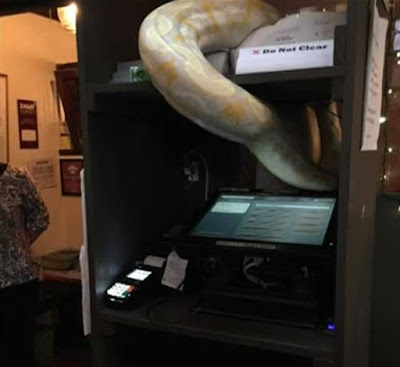 Authorities in Los Angeles, California, say a man has been arrested on suspicion of making criminal threats after customers of a sushi restaurant say he threw a large python at them. 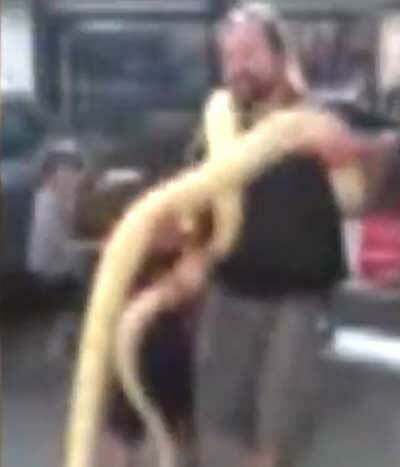 Employees of the Studio City eatery say the man had shown the 13-foot-long reptile to children outside of the restaurant on Sunday night moments before it was thrown at customers. They say it all started after he ate and paid for his $200 meal. Employees say he first showed a smaller snake to customers who then told him to take it out. That’s when they claim he got mad and returned with a larger snake. Waitresses allege that the man came in yelling obscenities and then threw the snake down. “Get this thing out! You know, everyone’s like eating so customers are yelling, ‘Get this thing out! Are you crazy,’ ” said Jessie Davaadorj, a waitress. Some customers ran out, terrified. “We asked him like three or four times and he said, ‘no.’ He was like starting fights with the customers so we had to call the police and fire department,” said Sissi Dashtort, another waitress. The snake tried to slither away, but got stuck. Animal Control eventually freed it and took it away. Police say the man was then arrested. Waitresses say they’ve served all sorts of customers, but nothing like this. “He was the only customer who brought a giant snake,” Dashtort said. Though many people were shocked, no one was apparently hurt.